Leadership Team Development is important to your team culture and organization development planning. Complex theories made simple and easy to implement. Free additional resources for serious inquiry. This includes a FREE team survey for 8+ team members for the first 100 teams. Limited time offer. 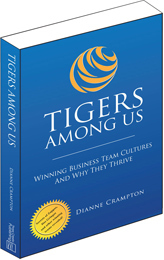 TIGERS Among Us: Winning Business Team Cultures And Why They Thrive provides leaders a path for building an authentic team-based work culture. Based on the TIGERS model of collaborative values – trust, interdependence, genuineness, empathy, risk and success – this book describes breakthrough practices for instilling collaboration in teams of two to hundreds. It shows how the creation of an authentic team culture in your workplace results in optimum productivity for your business and personal and professional fulfillment for employees. It teaches you what an authentic team-based culture actually looks like in the workplace – how it functions and why it works through best practices shared by online shoe store giant Zappos.com, cut flower grower Dos Gringos, Canadian Franchiser 4Refuel, and advertising agency Tribe Inc.
You will discover how to unlock your employees’ desire to make a difference and to treat your company with the level of care and commitment as if it were their own.